I've officially changed my status from fan to friend to advisor of Triggit, the easiest way to make money from you website. We first met at Web 2.0 Summit, hung out at Barcamp and connected around my weird theories for advertising beyond search. I watched them launch, used it on my blog and then they won the Web 2.0 Expo launchpad and SVASE best startup awards. Its a great team and a big opportunity. Should be fun. Location social software company Plazes has been acquired by Nokia. I'm an advisor to the Berlin-based startup and really happy for the team. Nokia is a customer of ours and through many trips to Helsinki have gotten a good feel for the culture. TechCrunch notes the synergy with Navteq, Brady Forrest notes how they will augment their Ovi portal. Should be a good fit, especially as Nokia transforms to an internet company. The Plazes team takes pride in being one of the first services in the location-context arena. When we started in 2005 the potential of that space might have been obvious but it was an uphill battle nevertheless with so many concepts gone sour before. We build the first service moonlighting. A year later we were honored to bring some of the smartest people on the web on board as our angel investors. A year later we got enough traction to bring more great investors on board. Now in 2008 we feel that it is time to take Plazes mainstream and really start making a difference for a larger group of users. Nokia is a perfect partner for us because they share our product vision and have the muscle to bring locative presence to hundreds of millions of people all over the world. What better partner than Nokia for exploring innovative ways of “connecting people”. This ruling has two privacy friendly results. First, the police need a warrant to get your email and text messages if stored for less than 180 days. Second, even if your employer pays for your use of third party text or email services, your boss can’t get copies of your messages from that provider without your permission. Wow. The case wasn't about personal accounts (60% of users have two or more email accounts), but personal messaging through corporate outsourced services. I wonder how this applies to port 80. Did we just gain more privacy protection for Facebook messaging? I'm at my favorite conference today, Supernova. At the first one we were inspired to found Socialtext. Instead of going to the VC or consumer web panels, I thought I'd learn a bit about a Berkman project. Here's an impressionary transcript. Panel Abstract: As established governing bodies of various sorts attempt to impose rules and restrictions on the Internet, the Net continues to have its own "constitutional moments," including many that are bottom up. The Berkman Center's recently launched Publius Project (http://publius.cc) is an effort to understand how the Internet is actually being governed, and how that might be changing. 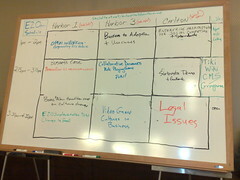 During this session, four diverse perspectives among the many represented within the project will examine how decision-making processes --whether via Web 2.0 technologies, international organizations, or business models -- give rise to norms, rules, and "constitutional moments" that affect both our behavior online and ultimately define the nature of the Net. Doc Searls (Linux Journal) couldn't make it. His post is here: what you frame is what you get. Colin: We are creating our future and the decisions we make will make change in the network. This is governance to look back to the origin of the word, steering. Tacit and explicit ways of steering. Now lets take turns presenting an idea and then we can explore them. Wendy: Here as a lawyer, so I will defend rules. That is rules and openness, as openness is achieved through regulation. In response to Weinberger's norms based tacit governance. But I think there are problems scaling that (I think regulation happens because of scaling issues, but it doesn't necessarily have to). Wikipedia has rules that have been developed that shouldn't repulse participation. This comes up in network neutrality debates. Yes it is important, but we wouldn't want the government involved, some say. But we need rules to retain that openness. To keep monopoly carriers from blocking content or VoIP or bitorrent. If we don't get into the regulatory fight then the rules will only be set by the carriers. Central question for governance is who gets to boss who around. ICANN is an experiment in governance of a resource, essentially a defense contractor in experimental form. What happened with this greenfield experiment and why you should be paying more attention. A general trend to get more people involved in governing the net. It is a CA nonprofit, formed to give advice about policy. This is a choke point where you could exert content control, cooperate with law enforcement to plunge people into darkness. The notion was to stay away from those issues and be a private group that would just coordinate. And the US would be a good steward of the goal, supporting global free flow of information. How do those rules get made? there are contracts between ICANN and the companies that run DNS that require them to adhere to policies for global security and stability. Few global rules and most things were left to local control. Who gets to change those rules? In 1998 Whois was supposed to be accessible, but the database has become very valuable for law enforcement and others, even though it goes against some norms of privacy. And its now locked in place with no sunset. The effect on business of the ICANN model. It has set up a particular way and business model without the ability to vary or evolve because of vested interests. It is hard to allow local variation in registries. Governments have more of a say on what domains will be created and policies that govern them. Now it is difficult to avoid being a choke point for top level domains. Regional and national government involvement is playing out, a constitutional moment for this private group -- we need to pay more attention to retaining the non profit model, or the government and law enforcement model to take over. Domain names are not that important, they say, but I want to point to this model as a experiment that is challenged by the titanic forces going in the other direction. I used to be an architect of physical cities. Where you design an infrastructure and set of rules, in a way that is fluid and flexible to allow for change. Any city has a 20-50 plan designed for change. Designing an operating system or the web is like designing for rules and fluidity. No matter what UI and interaction you put out will be wrong, and the best will come from the core community and their norms of use. How do you design for change? Outlook may have open calendars or closed in different companies. When it is time to change this and make it open, but what happens? If I use it to make private notes and you suddenly make it public it will freak me out. Perhaps you should design to not have past things public. People have different rulesets and norms, so how you make norms clear to people, their importance and how they should be followed. Sometimes they hear governance and don't understand how it effects what they do, but they know of the violations and fears. How can we make these governing principles relative to people's every day lives and make them flexible enough to change over time. Going to take the position from the business side. What's the differenence between corporate and nonprofit governance, the lack of lawyers? Corporate governance in the US, protecting the shareholder and making more money. Money is lonely and it like to go where other money is. But the tendencies like monopolies or causing standards to be in your favor, plus short term shareholders. IWB at IBM defined an open standard as something that was not controlled, because if we have control I have to exert influence to take care of my shareholders, but it is against our long term interest. With all the businesses on the internet, some structures cause good, some cause bad. The VC startup ecology is more innovative than big company R&D. Shirky says open ource is great because of a low cost of failure. Some of my investments have users before money, then get money and get up to 1M users, and have fully tested a product. By constrast, a Japanese company spends two million to decide to do something. Larry and Sergey connected a server to the internet and connected to every user on the net, instead of having to negotiate a bilateral agreement with every country. Small companies have a similar alignment to those who want to keep it open for democracy reasons. With Creative Commons, it is a standard set of rules on top of the stack, which reduces switching costs. The standard making process is different than the mishmash of social norms. My fear is we are so excited about mobile, but where does the money go? $330M goes to advertising, $4-5B content, $4-5 commerce -- most of it to carriers, bloated monopolies. And the money doesn't get pumped back out. Looking at where the money goes and if it goes to an ecology, given that each layer connects, if the top layers don't offer choice and freedom and money flowing to innovation, the whole stack suffers. Everybody need to realize that you can't have one chakra out of balance. In Japan they say bad content needs to be filtered from kids and they accept it, the carriers celebrate having a new filter. On the net we wouldn't put up with that. So Joi, what do we do? We had a glimmer of hope with the Clearwire deal, anything like that happening around the world? People are naive about the political nature of how money works. The telecom industry is the biggest voting block in Japan. Nothing more or less than politics. You can argue all you want, but you will never win. You need to bring in more money or more politics. Not like a Congressional hearing, its a real war. On the other hand, the internet fought that war and won, because the startups were able to compete. The environment let it happen and back then they didn't think that was where the power is. Users in a Japanese university said that the police should be running the internet, so they won't fight for it. Take a longer term view. Its easier to get on the same page if you are thinking bigger and broader. Where do we want to be in 20 years, what do we want it to look at, what should we expect from individuals to get us there. ICANN was set up to be long term, but the interests entrenched it. We need ways to route around and have users thing of themselves as the internet. Onewebday. I agree that the politics dominate a lot, but there are opportunities here. The norms decend from principles. In the 1990s with telecom WTO, a new regime created because the ITU was hopeless so they moved the conversations -- trade ministers trumped the communication ministers. Opportunity to move on from current round. Interesting to look outside the developed world, where the spotlight is not, Gramene Phone or Bracknet. Where the corporation carriers have as part of their charter to serve the communities first. They are NGOs, but big players in Bangladesh. The policies are serving the individuals first. In the UK you have social corporations. If and when those corporations have the financial wherewithall they could play the same role startups have for the net. Microfinance is not just about the money but a way of doing things. I struggle with how we achieve alignment between practice and theory. Advocacy model is slow, collaborative model is fast. Collisions in the private orderings and contracts. Cease and desist letters from the AP. They sent a copyright complaint, the quotes get pulled down because they invoke the language of the law that is hard for individuals to resist. Chillingeffects works by sheading light on abusive claims and making it more costly for companies to assert the law is something else than what it is. Most order in the world comes without law. But it is an elephants and mice story. When the elephants are attacked they ask for laws. But the mice keep going. The soverigns are being undermined because people are able to do their own work and the evolutionary order of self-organization progresses. I'm with a breed of enterprises called carrier and trying to make changes. The answer I have comes back to what Shirky said the cost of repair vs the cost of damage. Not failure as in the open source model. The reason the model works is we have sharply reduced the cost of repair. Even law will work if we can reduce that cost. The underlying model that scares me a lot has to do with expertise. Susan said, who decides? The difference between the internet and law or a corporation is the people who decide have invested in status and cant relinquish. We have lost sense of what that status is. We thing of expertise on the internet differently. Not an acquired elitist class. Historical concept of the expert is dead and the cost of repair needs to be at least as low as doing damage. The thinking looking at the cost of repair has not yet looked at how expertise has changed. High cost of repair comes from old principles. Efforts against spam outside of the existing systems. If one person is a spammer we shall censor all of you was an idea because there was no structure without appeal. Not doing as well in the extra legal systems as I had hoped. Take an edge of the organization, relax control to enable moderation and repair. You can retain the rest of the system's structure. People who make rules and design stuff get separated. Things have become so complex that the people who make things are not making rules and not using things. Design the rules so the are more fluid, regardless of open or closed. Make the process for making change easier. Want to try to be the optimist. We are missing the progress that is being made. This is a 25-50 year exercize in change. Think about how the net threatens institutions over time. In Canada the government engaged in a multi year exercize to engage users on what policy they needed and a week before implementation the carrier went back door to gut the whole policy. But beyond the day to day, look at momentous changes like Obama's fundraising on the net. Take a step back and look at the progress. The accidental stuff. Tendency to excessively control. SMS was an accidental use of a signaling channel. Then they planned and created MMS and it was a failure. Web 2.0 was an accident and people came together and gave it a name. Web 3.0 is a job creation thing, or a planned thing that will fail. When problems are buried, how do we take the things discussed in FCC backrooms and make them less arcane for regular people? Smart people like big books because it is nuanced and it really depends. When you plan things you get it wrong. But emergent things go off in the wrong directions as well. Users tend to choose non-commercial with (CC). People want to lean against the norms of commerciality, but don't get it. What should I do in my role from the top down. Hard to say one way of doing rules is better than another because it depends on who is involved. No silver bullet, but it requires general literacy, transparency and voice to as many people as possible. Fight chaos by making each node as smart as possible. Things have even changed in the last five years inside of Microsoft. But how do you structure things so when people believe in change are protected within their organization. Figuring out how to let people help. What can I do, in my role to make things better? We make progress on things when we can see them. The most important thing we could do is make things visible. Hope you will be involved in onewebday. We need rules that are flexible enough for disruptive innovation, the accidental change, cheap enough failure and where we get those rules, well, go back to constitutional principles. Our founders had thoughts like checks and balances even before there was a network. 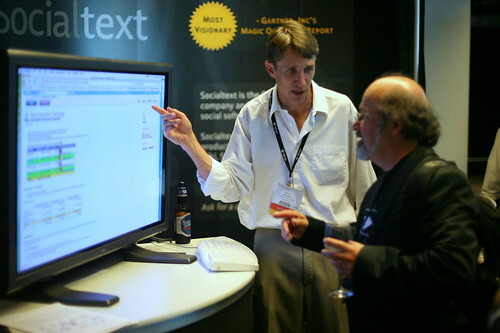 Interop is the genesis of this conference, even the first shows had a collaboration thread. But most of Interop focuses on IT. Business side of collaboration is the harder problem to solve, the focus of this event and one of the goals is to credentialize the concept of collaboration. Shortly after, collaboration emerged as a strategic imperative for enterprises. And the state of the art for solving line of business collaboration continues to evolve. A big change from back then is the vendor sports. Susan Scrupski saw a difference in how three of the top four enterprise software vendors (IBM, Microsoft & Oracle) were major sponsors. These big companies may be the drag queens of Enterprise 2.0, and an old French proverb says "they are not free who drag their chains after them," but everyones major vendor sports (otherwise we wouldn't be reading so much about Microo). The backchannel was particularly damning of Sharepoint compared to Lotus Connections (release 2.0 around the corner) and Microsoft got slammed again in a later panel. Sharepoint is stuck between major releases (that is, until the forced upgrade of Office 42.0), and Lawrence Liu is doing his best without a social software leg to stand on. Oracle didn't do any better or get kid glove treatment. All this made for good entertainment, but I'd take a McAfee-Davenport debate over all this. 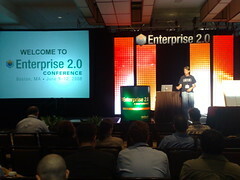 In stark contrast to the vendor sports and paid speaking slots was Enterprise2Open. Two people tried to hold sessions pitching their companies, and the law of two feet worked against them. There were solid conversations on adoption, use cases, business cases and edge cases like gaming. It provided a pressure relief valve for the structure of the commercial event, enabling Booz Allen Hamilton and BearingPoint to share their implementation stories that didn't get on the program for example. About half of the attendees has been at a Barcamp before, some came only for this free portion of the event and while there were self-organized hiccups, participants valued the experience. There are some things I learned to refine it. I was purposely hands off in facilitation, but there should be an available host in some sessions, particularly merged ones. Format follows space, and having a major stage for one room lead to broadcasted presentations, where by contrast the room where people naturally circled chairs was more conversational. Time was left to one afternoon, and we could have had more, as well as more concurrent sessions. Next year it may be more suited to run in parallel to the workshops and I'm looking for further feedback. A common thread for customers, facilitators and vendors was on adoption and culture. There were a lot of IT managers in attendance sharing the failures of their utility deployments. One open space session spent most of the time listing barriers to adoption. AIIM research presented the results of their adoption survey in the keynote before mine. Among their findings was age doesn't matter (Boomers vs. Milennials), some early IT adopters are frustrated and those who adopted KM were more inclined towards Enterprise 2.0. Other analyst firms (Gartner, Forrester) have psychodemogaphic profiles of organizations that can aid vendors in identifying earlier targets. Early IT Adoption frustration comes from IT-driven deployments. Previous bottom up demand from PCs, Spreadsheets, LANs, email and instant messaging was met by rolling it out as a utility. But unlike email or IM, this isn't a communication tool, collaboration requires engagement with the line of business. IT is good at the engagement required for process modeling and hard coding structured workflows. But the unstructured and collaborative nature of these tools requires line of business leadership, partnership with IT and applying best practices that are deeper than patterns. Simply opening up a wiki utility for people to consume results in a 1,000 dead wikis. Generations may not matter, but they are different. While there is no doubt about the social software proclivity of NetGens, and their demand for working this way, a more blended solution needs to address all generations. Some of the best implementations are happening where they shouldn't. One of our favorite customers has a self-described command-and-control culture. The best sessions at the Enterprise 2.0 conference were the case studies of cultures where people get "slapped down" for sharing (the CIA Intellipedia), highly regulated (Wacovia) and security-conscious (Lockheed-Martin). 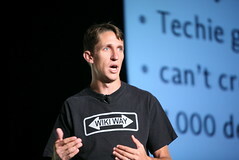 In-the-Flow wikis enable people do their day-to-day work in the wiki itself. These wikis are typically replacing email, virtual team rooms, and project management systems. Above-the-Flow wikis invite users to step out of the daily flow of work and reflect, codify, and share something about what they do. These wikis are typically replacing knowledge management systems (or creating knowledge management systems for the first time). Above-the-flow generally has a softer ROI, involves what can be at least perceived as a side activity and different and more difficult adoption characteristics. Adoption is closer to community building, but in the context where many forces want to work against the community. When it does succeed, and with the right practices it does, the benefits are worthwhile. But I believe that above-the-flow is less than half the opportunity for employees, partners and customers. This is where in-the-flow solutions come in. They speak to real business problems, can be repeatably implemented and adopted with the right practices, have harder ROI and are process-specific. Making them work requires coaching and management consulting services that are rare today. Through in-the-flow and above-the-flow solutions, use of Enterprise 2.0 tools and practices will be as common for knowledge workers in ten years as the PC is today. In 2.018, feel free to fact check me on this. Clay Shirky said business process is an embedded reaction to prior stupidity. Traditional enterprise software serves the goal of automating business process to drive down cost. I've held for some time that your average knowledge worker spends most of their time handling exceptions to process not executing it and augmenting those activities is an opportunity for social software. Mike Gotta chatted some golden nuggets during my talk that process is the way work should be done - work practices are how work is done (localized to a given situational context ... Some processes need work practices to be precise, other processes have more elasticity ... the more elastic a process is, the greater the opportunity to apply participatory applications. Broadly, software that supports work practices, implemented with best practices, enables better decisions, faster cycle and resolution times and adaptivity. I no longer believe we are headed towards an end of process (although that was a stimulating conversation). Because of social software, I do believe that we will redesign most processes with more transparency and participation -- and work practices will finally have context-aware tools that augment them and best practices will gain continual improvement through execution itself. 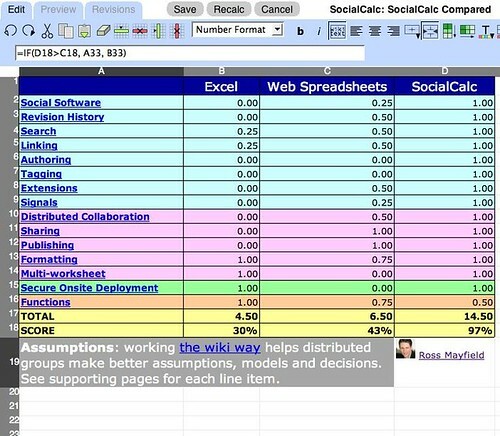 I was going to conclude with how SocialCalc relates to all this, but that's for the next post. My last post, btw, is my presentation at the conference.